Every year there is a big parade in Beijing. 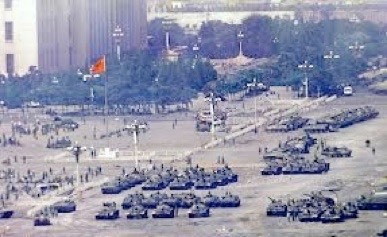 One of those big ones with lines of tanks and missiles that the west associates with large communist countries. They are somehow classic; though I am unsure how or why. It is one of the few things common to the USSR and the PRC versions of state behaviour. If people are going to protest in China, their target site will be Tian’anmen Square, the very large open space to the immediate south of the Forbidden City, somewhat reduced in size by the addition of Mao’s mausoleum. Way back in 1989 there had been a fairly long-running protest, over ‘repression and economic opportunity’¹. In 2014 such unrest was confined to Hong Kong. I have explained before that Tian’anmen is the sky peace gate, the gate of heavenly peace and the square is the large space, all 44 hectares of it, in front of the gateway. The reasons protests take place here is basically habit; in 1919 the May 4th (not June 4th) movement protested here, then Mao proclaimed the PRC in 1949 (1st Oct), then there were protests at the death of Zhou EnLai in 1976 [I don’t get that mix of words] and then in 1989. There are big displays every October 1st. The 1989 protest began in objection to the treatment of Hu YaoBang, who had been party Chairman encouraging more open political reform and, having died on April 15, there was a march by ‘students’ (my quotes there) calling for more democratic government. One might say, they wanted what they thought they had been promised. That said, it is perfectly possible that the protest was against rapid change and it is possible that there were many reasons for having a protest, all simultaneously valid. While the excellent wikipedia article lists the seven demands made during the protest, that doesn’t mean that everyone present agreed with every word. Many of the people who knew what it was they were protesting about are no longer available to be asked, nor were they available shortly after the event. It would just be warming up in BJ, so quite pleasant by British standards. Several sites refer to demands for ‘rehabilitation of the reputation’ of HuYaoBang; I have no idea what that means; by western standards it is meaningless, implying that history can be rewritten whenever we wish it so. I read here that martial law was declared on May 20 and the number of protestors rose to a million - the square will hold 100,000 and not look crowded. On June 3rd and 4th the army was called in to break up the protest. Whatever was intended went radically awry, as thousands were killed in quelling what was perceived as “counter-revolutionary rebellion”. The iconic photograph is from earlier, before tempers and then lives were lost. I can’t imagine students protesting much of anything. Wherever crowds gather—and Chinese love a crowd—there is a sense in which everyone is rapidly aware that this had better be seen to be good tempered or everyone on the outside will help it break up. Once you get past four, that’s a crowd and if everyone looks serious but is not engaged in a shouting match, then the reaction is that this is political and therefore dangerous for one’s health. I have had hash groups broken up for being 'too many people', even though we were visibly partying. I have seen a crowd in the street watching an argument over painting a street lamp. I have seen a crowd gather to watch a friendly very black African have a haircut. I have seen a crowd gather simply because there is a crowd [“What are we queueing for?” would not mean “Let’s jump the queue”, it would mean “For what are we queueing?”] This seen in WanFuJing², Beijing, several times. Of course, I can’t research that while in China, because the 25 year anniversary of the 35th May is approaching and the internet pipeline is squeezed virtually closed. I can access wikipedia, Tiananmen, Tian’anmen square but not Tian’anmen square incident. One may not discuss the date in June, along with not discussing Tibet and Taiwan (the three forbidden Ts), so we foreigners grew a habit of referring to the 35th instead. Capisce? In the intervening 25 years there has been huge social change in this country. I am of the opinion that this has been cleverly slowed down in a deliberate way. The total change is vast and, if there is a long game here, it is likely to eventually be seen that China only has to keep the change going a little further to go right past other societies and economies – and I think we are seeing some of the signs already. Things will go wrong if other parties (outside China, I mean) see that as somehow threatening – I find that idea incredibly selfish. It would be wrong to assume that all changes are occurring at equal rates – in some ways I observe capitalism as the west would wish it to be, but the managed economy doesn’t fit the west’s world model, however effective it is here (I’m a fan, but the same thing wouldn’t work in the west). The way the society grabs new gadgets and turns them to immediate use matches anywhere else in the world but, as is so often reported, there is very little invention and reflexive copying. This is a society with fashions; people do things because everyone else does; I guess that happens all over the world, but I often felt in Britain that fashion was followed because it (whatever ‘it’ might be) fit with the ideas of the follower of the moment. And with the ideas of the moment of the follower of fashion, too. In a sense, my feeling was that some part of the fashion, even if just the representative rebellion factor of a radical haircut, found a home in someone’s head and therefore was followed in a more conscious way than we think applies to sheep⁴. The death toll is not well recorded and lies in three or four figures but not two or five. Some were executed for involvement – entirely believable. 19 May rally has 1200 thousand. Zhao ZiYang, Gen Sec of the PRC at the time attends and asks for the demonstration to end. Later that day martial law is declared (by LiPeng, the PM). 01June tv crews are stopped, telecasts are stopped. 05June the iconic photo occurs. 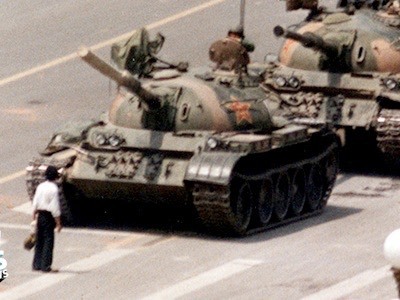 The unknown man stands in front of the tank for several minutes. Follow on details: February 2006 saw the release of Yu DongYue, imprisoned for throwing paint at a portrait of Mao during the rally above. Picture at top from Google images, where there are many copies to choose between. I think the original image was from CNN. 2 This used to be WanFuKing³ street, when the capital was Peking. Several shop fronts were photographed many times by foreigners. I have come across the wong fook hing bookshop 180A, Ma Tau Wei Road, Hung Hom, Hong Kong, the Fu King chinese restaurant (Lake City, Florida). The area was renamed once an official discovered why the devils liked it. 3 I’ve written about this before, in essays the 16 - English Club and 109 - Temple of Heaven. Try a google of wongfuking, Wan Fu King (a warrior king, Wan-Fu); there’s an alleged soccer player Fu Kin Sum Won who at least one relative on FB called Fu Kin No Wan. Sum Ting Wong is a serious fighter. 4 I still agree with Terry Pratchett that camels may be clever. I maintain that sheep aren’t quite as stupid as we make out in our language. Or not necessarily so, anyway. Read ‘Eating Grass makes you stupid’, essay No3. The panoramic is from Wikipedia; their accompanying text is good: Panorama image map of Tiananmen Square from the north atop Tiananmen's gate tower, showing the Square beyond Chang'an Avenue, with the Monument to the People's Heroes and Mao Zedong Mausoleum at background centre, the National Museum of China to the left and Great Hall of the People to the right. Doing some editing in 2018 I read the Talk page on the wikipedia article. Many of my points are raised here, which I read as “You are not alone”. the Talk page indicates that many of the photos from the period have been doctored, so there is a story to be told about the one I used, declared to be one of the few shown to be genuine. See Tank Man. See here for other iconic photos.